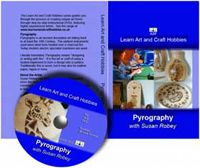 The "Pyrography with Susan Robey" introductory instructional DVD will guide the beginner through the entire process of creating their first pyrography items. With advice on everything from tools and equipment required, suitable surface materials, how to construct points for the hot wire machine, technique practice, sourcing reference material, transferring the design, together with personal tips gained from many years of experience, you will be fully prepared for the projects in both wood and leather. Presented in the style of an easy step-by-step tutorial with intuitive and descriptive chapters, any of which can be re-visited. Actual size design templates for the projects demonstrated on the DVD will be emailed to anyone purchasing a copy from this site. Also included will be a comprehensive technique development project not covered on the DVD. This would normally form part of a series of workshops to aid progression to a more advanced level. RRP of the DVD is £27.00, currently available at the reduced price of £18.90. To purchase, please click on the PayPal link below.